Sidney Altman discovered that RNA moeity of RNAse P (M1 RNA) alone is able to perform enzymatic cleavage of ptRNA, which won him the Nobel Prize of Chemistry in 1989. However, when I read the Nobel Lecture on Bioscience Report, Vol. 10, 1990, the figure on page 325 (the image below) confused me. Lane 3: R+P, [Mg(II)]=10 mM. ptRNA cleaved. Lane 5: R, [Mg(II)]=100 mM. ptRNA cleaved. Lane 6: R+P, [Mg(II)]=100 mM. ptRNA NOT cleaved. Lane 8: R+20P, [Mg(II)]=100 mM. ptRNA cleaved. In Lane 3, RNAse P was formed and was able to catalyze cleavage; Lane 5 showed that M1 RNA with higher concentration of magnesium could function as enzyme. 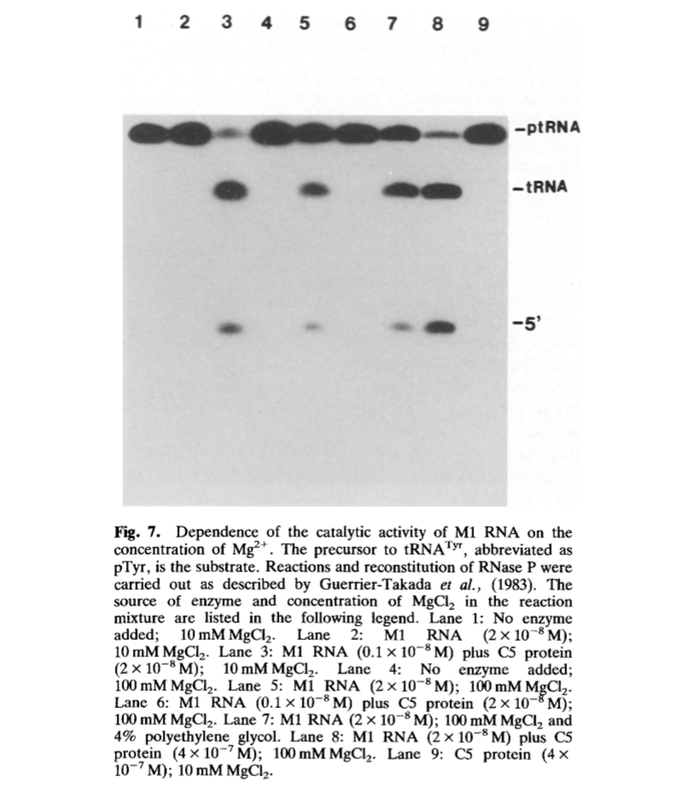 And how come by increasing the concentration of C5 protein by a factor of 20 compared to Lane 6, M1 RNA was able to function again, as shown in Lane 8? I would appreciate any kind of help, and sorry for my poor formatting. Browse other questions tagged molecular-biology enzymes rna or ask your own question. Do two compatible tRNA codons bond together? Does tRNA contain parts with double-helix structure? Why does RNA synthesis in E.coli begin with a Purine? Why can't nucleotides when mixed together form an RNA on their own?